FlagandBanner.com is more than just a flag store. We are a family and female-owned business that began humbly in 1975. You can be confident in doing business with a company that has been around for 40+ years to give you unparalleled customer service. 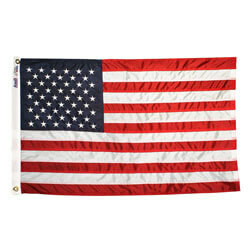 We offer the highest quality American Flags that are always made in the USA. Our list of products includes custom flags, indoor and outdoor flagpoles, military flags, state flags, as well as banners and pennants of all styles and sizes. Stop by our headquarters and gift shop in Little Rock, Arkansas or shop with us online. "Thank you for lower prices so those of us who are on a low fixed income, can still purchase these items for our loved ones." "These guys have top notch quality products and VERY good customer service... I highly recommend them!!!" "It's all about customer service, and even though I was doing all my ordering online, it felt as if someone was in the room with me helping me locate the flags I needed. Thank you"
"I am excited to find the company and now to get my state flag. It is something that I need." I love my Arkansas flag. For what I needed it is just right. It is well -made and the price is a good one. I like it. "Communication from the company was great and quality is very good. " I haven't put them up yet, however just taking them out of the box, the nylon seems of very good quality and they look great. "I have ordered 2 flags and one door hanging and have really liked all 3. The flags have stayed nice through sun, rain, and snow. The colors have not faded. I will continue to buy from this shop when needing additional outdoor adornments." "QUALITY PRODUCTS at GREAT PRICES , FAST SHIPPING!!! Flag and Banner.com store is by Far a Hands Down Company , Bar None !!!!!! You WONT Be Disappointed with your Purchase !!!!! Many Thanks !!!!!!" "Always an easy and pleasant experience. Quality products." "I was looking for a particular flag for a week online and after numerous websites without success I finally found it here!" "Very efficient. Thank you for making e-commerce simple !" "Site is easy to use and they had everything I needed as always. Flagandbanner.com is our go to shop for our flag needs. They are also available to answer questions and very friendly. " "I have never experienced anything but excellent service, quality products and good prices at Flag and Banner. " 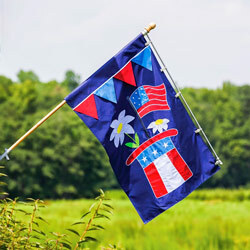 "Flag and Banner has become my go to place to order all of my flag supplies. I am replacing some of the flags I proudly display in my properties Looking forward to the fresh colors!" "I have used flag and banner many times in the past and they never disappoint. Great banners, reasonable price and turnaround time is great! Their website is also user friendly, so i will continue to use them in the future." pennant colors are beautiful and comes just as described! "Thanks to Grady McCoy for steering me in the right direction." "Wonderful my brother in law who was a past Chief in our Vol. Fd. passed away in place of flowers your grave marker will be with him forever"
"Was able to chat live with Wendy which REALLY helped as I needed this product ASAP and she was able to answer all my questions." "It's ALWAYS so easy to find what I want on this site. They often have really good sales. I receive my order very quickly which is very helpful to me. I won't order my flags from anyone else! LOVE IT!! Thank you flagandbanner!!!!!" Great place to get flags. Super happy with this purchase. Great quality! "Overall Amazing experience. Customer Service was superb. The product arrived before the initial delivery date. Putting together the product was simple and the final display was as promised. Love this company. I will definitely be using this company again and again. I have already been talking to friends and family about you guys!!!!" "I have shopped both on-line and in store. Great company and great people. I highly recommend them." Excellent quality at a fair price. As an international company I needed not only our great American flag but also flags from around the globe. I made the huge mistake of purchasing American flag from another company and it is already tattered on the ends. All other flags were purchased from Flag and Banner and hold up so much better in the weather. I will never shop anywhere else for my flags. "I used to live in Little Rock and love supporting 'local' businesses. I have ordered several different products over the years and have been very happy with the service and quality of your products."